Blogging can be a labor of love. It can also be something your boss makes you do or something you struggle to make time for during hectic days and weeks. The good news is, inspiration for your blog is everywhere! You’ve just got to know where to find it. Here are seven (maybe unexpected) places to look for inspiration if you’re having trouble coming up with new blog topics. You never know what’s going to set off your creative spark! 1. Your Own Blogroll The first thing any blogger should do is set up a “Blogroll” for themselves full of blogs they find interesting. They don’t necessarily have to be relevant to your particular blog topic but if you want to read them often, like the style, or even find them agitating, add them to the list! Seeing what other bloggers you respect or admire are talking about may give you a nudge towards a topic you hadn’t considered. 2. A News Search It’s relatively easy to use a search engine like Google to see how particular words or phrases are trending in the news. Let’s say you blog about food, for example. Why not search “food trends” or “desserts” in a news engine and see what’s going on within that market? Bet there’s at least a story or two that piques your interest. 3. Switch Mediums Odds are, you probably spend too much time reading blogs! If you’re a blogger you need to get out of your comfort zone and check out other online mediums (think: Facebook, Instagram, Vine) to see what other communities are chattering about. After you’ve done that, look through some traditional magazines and newspapers too. Don’t lose perspective just because your area of expertise is blogging. 4. Ask Your Readers Bloggers are sometimes hesitant to “break the fourth wall,” that is, talk directly to their readers. Don’t be! Why not ask them if there are questions they’d like answers, a topic explored, or even give them a small poll to take to help you come up with a full article? People love to give input online, especially when they think that input may lead to customized content. 5. Find an Overlap One of the fastest ways to come up with new, unusual content for your blog is to dissect where your topic overlaps another. Let’s say you write about business trends. Perhaps you’ve been hearing a lot of buzz about Game of Thrones lately…why not merge the two? A post about how they overlap will garner fans of each topic, essentially widening your audience! 6. Digg, Reddit, Tumblr… There are plenty of places online where people gather just to gab. Odds are there are several thousand groups on any given site talking about something you know nothing about! Become an active listener and read the comments under articles you’re interested in learning more about. If people are talking about it somewhere else, they’ll be more inclined to want to read your blog too. 7. Look Up! Sometimes it’s hard to find inspiration when you’re staring at a screen or printed pages all day long. Whether you’re confined within the walls of a cubicle or spend hours a day using your laptop you may need to unplug to truly get inspired. Sometimes all that’s really required to open up your mind is a walk around the block or a day spent with your kids to give you a fresh perspective. Inspiration is everywhere! It’s impossible to know when the Next Great Idea is going to hit you (carry a notepad!) or when you’re going to write a blog post that really resonates with your readers. Change things up, explore new places, and keep your eyes open to find stimuli wherever you are. Contributed by – Ryan Currie. He is a product manager at BizShark.com, with 5 years experience in online marketing and product development. In addition to web related businesses, he also enjoys the latest news and information on emerging technologies and open source projects. 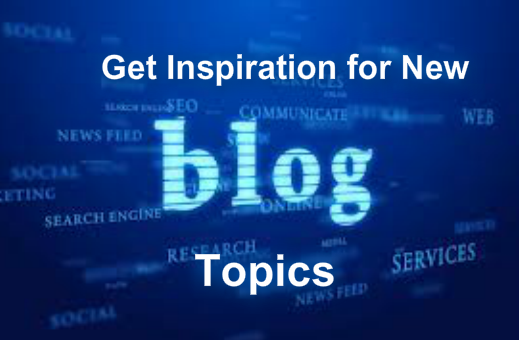 nice tips indeed.Finding new topics for blogging is quite difficult but as mentioned you its not impossible.You dig out really good sources to find out new blog topics. thank you for sharing. First of all very informative post indeed. This is the reason why I haven’t started my blog yet, because whenever I decide to write I always get stuck on subject or topic. So, thanks for sharing ! Today, There are many blogs under the same niche…thousands! Sharing personal experience relating the blog niche could be better to make it different and meaningful. Ya, In blogging sometime our mind did not helps to think about topics and contents, in that time the above points are really helpful to write a new post. StumbleUpon is also a great tool to find new topics for your Blog.It is also great for bringing traffic to your site.